the dictation does not work as shown in help screen and product demo. when i say ‘peroxide and orange juice and distilled water’, the words just sit in the search field. 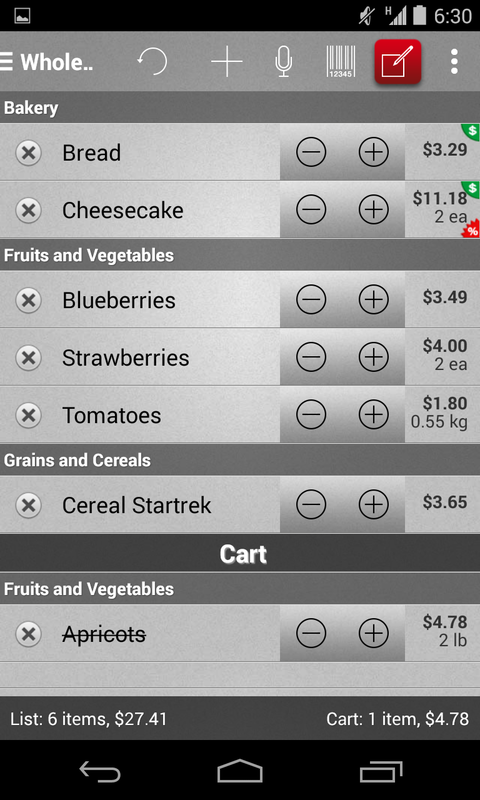 when i tap to select, it dumps them all into one line instead of displaying separate items. i must be skipping a simple step. can you advise? Josephine, kindly note that there are two microphone buttons. Please make sure that you are using the one on the app’s toolbar, not the one on the popup keyboard. Is there any way to add tax? Yes, the tax field is in the bottom of Edit Item screen. For more details please see Edit item User’s Guide. Barcode scanner+ does not work. The number matches but the product description is different. Hi Sterling, thanks for your feedback. Could you please give an example of a couple of incorrect items? Thank you. 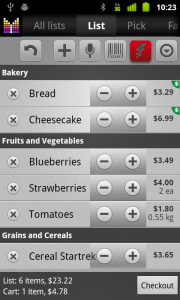 Please note that description can be fixed in the app after you scan an item and it will remain in the app going forward. 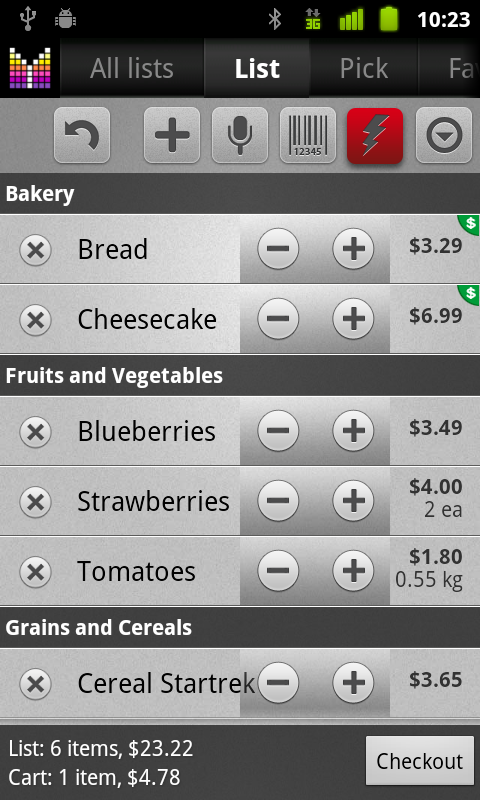 Love my MG app, most used app I have. Two little problems though since getting a new phone. I synced my list over (or thought I did), but doesn’t seem as though it brought over all my edited items, such a prices and details. Also .. when I go to add an item to my list, it automatically goes to Edit mode every time. Dave, if you don’t want to open Edit screen, please uncheck “Details mode” option under Menu > Settings > Options. As for sync troubles, please contact us at hi@mightypocket.com with your Account ID so we could have a closer look. Thank you. Chris, do you mean you’d like a record on the notification bar whenever you have outstanding items or only when new items are added to your list from another handset through shared shopping lists? Bill, thanks for the heads-up. We look into this before the next update. Perhaps scanning postponed item when filter set to “Current” should move the item from “Postponed” to “Current” state. Please let me know if you have any further questions or comments. Hi, I was wondering if you could add a place to indicate package quantity that doesn’t involve compare mode? Thanks. Chiu, thanks for your question. We recommend using Details field to indicate item packaging (tap Name field and enter Details as 2nd line or long-tap Name field > Details). Also you could use Comments field. Please let me know if you have any further questions or comments. What is the difference between the “master list” and the “pick list”? Hi Diane, thanks for your question. Master list is a way of grouping a few sub-lists in a single listing. 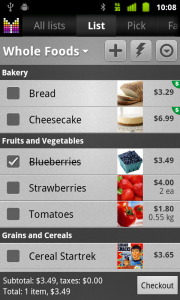 Pick list is a product catalog which consists of the preset catalog and items which you add to your shopping lists. Please let me know if you have any further questions or comments. 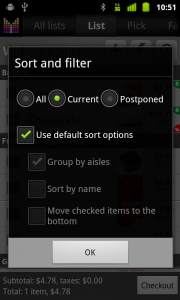 I cannot seem to get my lists to go into isles it just lists the items and does not categorize them. It used to but not sure why it dxoes not do so presently. Any suggestions? Laura, most likely you need to turn off the “Master list” setting for your list. If it’s on, items are grouped by sub-lists rather than by aisles. For more details please see Master lists in User’s Guide. Anyway to completely disable full screen? Jim, option to disable Auto Full Screen will be available in the next update. Thank you for your patience.